Print Edition. 51 issues of The Hollywood Reporter, providing an unmatched level of access and influence, delivered weekly. Daily Edition PDFs sent to your inbox. Special Issues on key industry events. content, box office grosses, and weekly TV ratings. breaking movie and TV news. Money Back Guarantee: You may cancel at any time during your subscription and receive a full refund for all unmailed copies. iPad Edition Access with exclusive behind-the-scenes video, movie trailers, photo galleries and a live feed of breaking movie and TV news. Give a gift or send international . Local taxes, if applicable, will be added to your order. 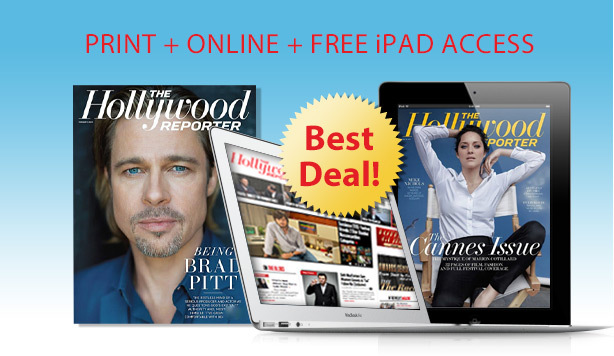 You authorize HOLLYWOODREPORTER.COM to charge your credit/debit card at the 12 months subscription price now and in time to renew your HOLLYWOODREPORTER.COM subscription, without interruption, before the start of each new 12 months term at the subscriber rate then in effect unless you tell us to stop. HOLLYWOODREPORTER.COM will notify you via email approximately one week before your credit card is charged confirming your service and rate. You may cancel at any time by contacting customer service at 866-525-2150 (U.S.) or 845-267-4192 (Outside U.S.). If you do not want your subscription to be automatically renewed, please UNCHECK this box. The charge will appear as Prometheus Global Media on your credit card statement. Prometheus GLOBAL MEDIA, LLC eMedia Premium Subscriber Agreement BY COMPLETING THE ENROLLMENT PROCESS, YOU AGREE TO THE TERMS OF THIS SUBSCRIBER AGREEMENT, JUST AS IF YOU HAD SIGNED THE SUBSCRIBER AGREEMENT. IF YOU DO NOT WISH TO BE BOUND BY THIS SUBSCRIBER AGREEMENT, PLEASE DO NOT COMPLETE THE ENROLLMENT PROCESS. Please read all of the following terms and conditions carefully before completing the enrollment process and agreeing to this Agreement. The Agreement sets forth the terms and conditions on which Prometheus GLOBAL MEDIA, LLC Business Media, Inc. ('Prometheus GLOBAL MEDIA, LLC') will furnish you ('SUBSCRIBER') a limited non-exclusive, non-assignable license to access Prometheus GLOBAL MEDIA, LLC's Online Premium Services electronic database and/or print publication subscription service (collectively the 'SERVICE'), as the same now exists or is hereafter modified. By completing this enrollment process, you agree to be bound by the terms and conditions set forth herein, including but not limited to the payment terms and limitations on the use of the SERVICE data. Information received by SUBSCRIBER from the SERVICE is provided solely for the use of the SUBSCRIBER. Unless separately and specifically licensed to do so in writing by Prometheus GLOBAL MEDIA, LLC, SUBSCRIBER agrees not to re-transmit, disclose or distribute any of the information received from the SERVICE, to any other person, organization or entity. SUBSCRIBER expressly agrees that the SERVICE shall be used solely for the benefit of the SUBSCRIBER and data derived from the SERVICE (including print publications, if applicable) shall not be redistributed by SUBSCRIBER. SUBSCRIBER acknowledges that all information and content made available to SUBSCRIBER through the SERVICE, including but not limited to text, graphics, logos, news reports, articles, writings, listings, photographs, images, recordings, and directory information, are the exclusive property of Prometheus GLOBAL MEDIA, LLC or of third-party partners which have agreed to furnish such information to the SERVICE, and are fully protected by copyright law, including United States copyright laws and the copyright laws of other countries. All software used on the SERVICE is the property of Prometheus GLOBAL MEDIA, LLC or its software suppliers and protected by United States copyright laws and the copyright laws of other countries. SUBSCRIBER may use the information in the SERVICE under the following terms. SERVICE grants to SUBSCRIBER a personal, non-transferable license to use the data contained in the SERVICE for research, planning and marketing related purposes. SUBSCRIBER may not use the information for development of data-related products or services, the creation of any database product, or for data provision services. SUBSCRIBER agrees to make periodic payments to Prometheus GLOBAL MEDIA, LLC in consideration for the SERVICE. SUBSCRIBER agrees that the length of the subscription period is determined by the subscription plan selected by SUBSCRIBER during the sign-up process. The periodic fees will be based on the rate schedule in effect at the time the subscribers signs up or renews. Any applicable sales or use taxes will be payable by SUBSCRIBER, and may be included in each periodic statement. SUBSCRIBER'S use of the SERVICE will be subject to credit limits established for SUBSCRIBER'S credit card by the issuer of such card. For Automatic Renewal, it is understood and agreed that the features of the SERVICE are subject to change without notice to SUBSCRIBER. By completing the enrollment process, SUBSCRIBER acknowledges understanding that periodic charges will be billed to SUBSCRIBER'S credit card. If SUBSCRIBER enrolls in Automatic Renewal of subscription, SUBSCRIBER will automatically be billed at the start of each new subscription period until SUBSCRIBER terminates subscription to SERVICE. SUBSCRIBER may terminate enrollment in Automatic Renewal at any time by emailing Subscriptions@THR.com or by calling 866.525.2150. The SERVICE shall be deemed terminated on the last day of the then in effect subscription period. SUBSCRIBER agrees that the subscription fee is non-refundable once paid. SUBSCRIBER agrees that any unauthorized use of the SERVICE (or any data derived therefrom) by SUBSCRIBER may result in immediate termination of the Agreement, without refund of any pre-paid fees. SUBSCRIBER represents and warrants that the information provided during the subscription process is true and accurate and agrees to update the information thereafter in the event of any changes. Prometheus GLOBAL MEDIA, LLC reserves the right to terminate SUBSCRIBER's access to the SERVICE in the event that SUBSCRIBER provides any false information to Prometheus GLOBAL MEDIA, LLC as part of the subscription process, without refund of any pre-paid fees. In the event of such termination, SUBSCRIBER will continue to be liable for applicable fees for the period prior to termination, together with such other remedies as to which Prometheus GLOBAL MEDIA, LLC may be entitled. SUBSCRIBER shall select a unique username and password to obtain access to the SERVICE. SUBSCRIBER shall be solely responsible for maintaining the confidentiality of this information and for restricting access to SUBSCRIBER's computer. SUBSCRIBER shall be solely responsible for any and all use of SERVICE, including without limitation, any and all charges incurred by a third party, under SUBSCRIBER's username and password. SUBSCRIBER shall not share the username and ID with any third party. If at any time SUBSCRIBER should learn or suspect that SUBSCRIBER'S password has been obtained by a person not authorized by SUBSCRIBER to use it, SUBSCRIBER shall promptly notify Customer Service at 866.525.2150 and confirm such notice in writing. Upon receiving such telephonic and written notice, Prometheus GLOBAL MEDIA, LLC will assign a new password to SUBSCRIBER without charge. Neither Prometheus GLOBAL MEDIA, LLC, nor its respective officers, directors, employees, affiliates, subsidiaries, or agents shall be liable for any loss resulting from delays or interruptions due to electronic or mechanical equipment failures, telephone interconnect problems, internet failure, intranet failure, extranet failure, hardware or software defects, storms, strikes, walkouts, fire or other casualty damage, or other causes over which they have no direct control, or any loss resulting from the contents of the SERVICE, or any errors in the transmission thereof. Prometheus GLOBAL MEDIA, LLC will have no responsibility to provide SERVICE to SUBSCRIBER during interruptions of SERVICE. This Agreement and the license rights granted hereunder shall remain in effect during the entire term of the Agreement. SUBSCRIBER may choose to cancel during the term of the Agreement. Regardless of the reason for cancellation or termination, the periodic access/subscription fees, per-article charges (if any), per-report charges (if any), and any other fees or charges previously paid by SUBSCRIBER are non-refundable. If SUBSCRIBER has made an advance payment for access, the advance payment paid by SUBSCRIBER is non-refundable, regardless of the reason for cancellation. Prometheus GLOBAL MEDIA, LLC reserves the right, at its sole discretion, to immediately terminate SERVICE upon failure of SUBSCRIBER to make payment when due or if SUBSCRIBER violates any of the terms and conditions of this Agreement. This Agreement is not assignable by SUBSCRIBER. There shall be no amendment or modification of this Agreement unless the same is in writing and signed by the Product Manager of the SERVICE. SUBSCRIBER acknowledges and agrees that Prometheus GLOBAL MEDIA, LLC reserves the right to, and may from time to time, monitor any and all information transmitted or received through the SERVICE. Prometheus GLOBAL MEDIA, LLC, at its sole discretion and without notice to SUBSCRIBER, may review, censor or prohibit the transmission or receipt of any information which Prometheus GLOBAL MEDIA, LLC deems obscene, offensive or otherwise inappropriate. SUBSCRIBER shall provide all telephone, modem, internet connection, intranet connection, extranet connection and other equipment necessary for SUBSCRIBER to access the SERVICE and the costs of any such equipment and telephone connections or use, including any applicable taxes, shall be borne by SUBSCRIBER. (a) Prometheus GLOBAL MEDIA, LLC, ITS AFFILIATES, SUBSIDIARIES, OFFICERS, DIRECTORS, EMPLOYEES, AND AGENTS DISCLAIM ALL WARRANTIES, EXPRESSED OR IMPLIED, INCLUDING ANY WARRANTY OF MERCHANTABILITY OR FITNESS FOR ANY PARTICULAR PURPOSE EXCEPT AS SET FORTH IN THIS AGREEMENT. SUBSCRIBER acknowledges that all information and services provided in connection with the SERVICE are compiled from and distributed by sources which are often beyond the control of Prometheus GLOBAL MEDIA, LLC, and it is understood and agreed that Prometheus GLOBAL MEDIA, LLC, its affiliates, subsidiaries, officers, directors, employees, and agents make no warranty, expressed or implied, with respect to the information provided to SUBSCRIBER by the SERVICE. Prometheus GLOBAL MEDIA, LLC, its affiliates, subsidiaries, officers, directors, employees, and agents also make no warranty of the continuous availability of the SERVICE. SUBSCRIBER, under this Agreement, agrees that use of the information provided shall be at SUBSCRIBER's sole risk. SUBSCRIBER assumes the risk of errors and/or omissions in the information provided, and in its transmission or translation. SUBSCRIBER AGREES THAT IN NO EVENT SHALL Prometheus GLOBAL MEDIA, LLC, ITS AFFILIATES, SUBSIDIARIES, OFFICERS, DIRECTORS, EMPLOYEES, OR AGENTS, BE LIABLE FOR DAMAGES ARISING OUT OF THE USE OR INABILITY TO USE THE SERVICE INCLUDING BUT NOT LIMITED TO ANY INCIDENTAL, CONSEQUENTIAL, DIRECT, INDIRECT, COMPENSATORY OR SPECIAL DAMAGES. (b) NOTHING IN THIS AGREEMENT WILL BE CONSTRUED AS ANY FORM OF WARRANTY OR REPRESENTATION BY Prometheus GLOBAL MEDIA, LLC, OR AS CONFERRING BY IMPLICATION, ESTOPPEL OR OTHERWISE ANY LICENSE OR RIGHTS, OTHER THAN AS MAY BE EXPRESSLY DEFINED HEREIN. (c) Prometheus GLOBAL MEDIA, LLC MAKES REASONABLE EFFORTS TO OBTAIN ACCURATE AND UP-TO-DATE INFORMATION BUT Prometheus GLOBAL MEDIA, LLC ASSUMES NO LIABILITY FOR INACCURACIES IN ANY OF THE INFORMATION OR CONTENT MADE AVAILABLE TO SUBSCRIBER THROUGH THE SERVICE. Prometheus GLOBAL MEDIA, LLC RESERVES THE RIGHT TO EDIT ANY INFORMATION OR CONTENT MADE AVAILABLE ON THE SERVICE BASED ON EDITORIAL JUDGMENT. (d) SUBSCRIBER HEREBY ASSUMES ALL RESPONSIBILITY FOR DETECTING AND ERADICATING ANY COMPUTER VIRUS OR PROGRAMS WITH A SIMILAR FUNCTION THAT MAY BE PASSED TO SERVICE FROM SUBSCRIBER OR TO SUBSCRIBER FROM SERVICE THROUGH SUBSCRIBER'S USE OF THE SERVICE. The provisions of this Section 9 shall survive termination of this agreement. Notwithstanding the enforceability or non-enforceability of any other provision of this agreement, SUBSCRIBER hereby agrees that the maximum aggregate liability of Prometheus GLOBAL MEDIA, LLC, its affiliates, subsidiaries, officers, directors, employees, and agents to SUBSCRIBER for any claims arising from or related to this agreement, whether in contract, tort or otherwise, shall be limited in an amount equal to (a) $250.00, or (b) ten percent (10%) of all sums paid by SUBSCRIBER to Prometheus GLOBAL MEDIA, LLC under this agreement; whichever is greater. This provision shall survive termination of this agreement.SUBSCRIBER shall defend, indemnify and hold harmless Prometheus GLOBAL MEDIA, LLC, its affiliates, subsidiaries, officers, directors, employees, and agents from any claims and expenses, including reasonable legal fees, related to any breach of this Agreement by SUBSCRIBER or SUBSCRIBER's use of the SERVICE. It is understood and agreed by and between the parties that if there is any conflict between this Agreement and SUBSCRIBER'S purchase order or any other document not signed by Prometheus GLOBAL MEDIA, LLC, this Agreement will govern. This Agreement shall be governed by the substantive laws of the State of New York applicable to contracts made and performed in the State of New York, without regard to principles of conflict of laws. Any action or proceeding arising under this Agreement shall be commenced exclusively in either the courts of the State of New York situated in the County of New York or in the United States District Court for the Southern District of New York; and such action or proceeding must be commenced no later than one year after the accrual of the claim giving rise therein. SUBSCRIBER hereby consents and submits to the personal jurisdiction of such courts for the purpose of litigating any such action or proceeding. SUBSCRIBER agrees that if Prometheus GLOBAL MEDIA, LLC takes action (by itself or through its representatives) to enforce any of the provisions of this Agreement against SUBSCRIBER, including collection of any amounts due hereunder, Prometheus GLOBAL MEDIA, LLC shall be entitled to recover from SUBSCRIBER (and SUBSCRIBER agrees to pay), in addition to all sums to which Prometheus GLOBAL MEDIA, LLC is entitled or any other relief, at law or in equity, reasonable and necessary attorney's fees and any costs of any litigation.